Interesting fact: I pre-ordered a Janet Evanovich book on AMAZON for a delivery date in October. I purchased the pre-ordered book in Costco in June. What’s up with that? Luckily I could cancel my pre-order. Google and Barnes & Noble are joining forces to tackle their mutual rival Amazon, zeroing in on a service that Amazon has long dominated: the fast, cheap delivery of books. Starting on Thursday, book buyers in Manhattan, West Los Angeles and the San Francisco Bay Area will be able to get same-day deliveries from local Barnes & Noble stores through Google Shopping Express, Google’s fledgling online shopping and delivery service. 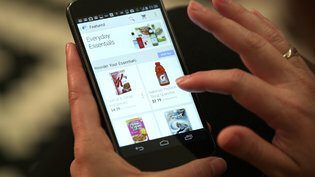 Google Shopping, which began operations about a year ago, allows online shoppers to order products from stores like Costco, Walgreens, Staples and Target, and have them delivered to their doors within hours. The partnership could help Barnes & Noble make inroads into online sales when its brick-and-mortar business remains stagnant. The company has closed 63 stores in the last five years, including some in bustling areas of Manhattan and Washington, leaving it with a base of about 660 retail stores and 700 college campus stores. Its Nook business fell 22 percent in the fourth quarter compared with the period a year earlier, according its most recent earnings report. Michael P. Huseby, Barnes & Noble’s chief executive, called the arrangement with Google “a test” and said that he viewed it as a way to increase the bookseller’s online reach and improve sales from its physical stores. “It’s our attempt to link the digital and physical,” Mr. Huseby said. Amazon poses a persistent and growing threat to Google and Barnes & Noble. Its rise has contributed to lagging sales and diminished foot traffic in Barnes & Noble’s physical stores, and it dominates the online market for print books. Amazon’s popularity as an online shopping destination has the potential to undercut Google’s lucrative search engine advertising business. By adding Barnes & Noble to its list of 19 retail partners, Google is making a more explicit grab for Amazon’s turf. The partnership also comes at a moment when many authors and book buyers are frustrated with Amazon because of what they say are its punitive negotiating tactics in its standoff with the publisher Hachette over e-book pricing. The competition to provide faster shipping has been increasing in recent years as retailers have scrambled to claim a piece of the growing e-commerce market. Amazon has already taken the lead in same-day delivery, and on Wednesday the company announced that it had expanded its same-day delivery service to 10 cities from four. Amazon’s same-day service costs $5.99 for members of its Prime program, and $9.98 for others. Walmart and eBay have also introduced same-day deliveries. Google’s approach differs from that of Amazon and other big retailers. Instead of relying on warehouses full of merchandise, Google is using a fleet of couriers who collect products from local stores, sort and bundle them and deliver them within a three- to four-hour window selected by the customer. Delivery is free for subscribers to Google Shopping Express, and costs $4.99 per delivery, per store for others. Membership is free for the first six months. Google has not announced what the subscription fee will be. Google has said it plans to expand its delivery service to Brooklyn and Queens. Barnes & Noble stores participating in the partnership with Google, which include the Union Square store in Manhattan, the Marina del Rey store near Los Angeles and a store on Stevens Creek Boulevard in San Jose, will have someone on site to take online orders for books, toys, games, magazines and other items. Google will collect the orders and hand them to a courier. Barnes & Noble stores have 22,000 to 163,000 titles, depending on the store size. Barnes & Noble is not processing Google Shopping orders on its own website, which also offers free express shipping to its members, and free shipping for orders that are $25 and up to everyone. (In New York City, Barnes & Noble.com customers can get same-day shipping). Instead, it expects to pick up incremental sales from Google Shopping’s customers, said Jaime Carey, chief merchandising officer at Barnes & Noble. A version of this article appears in print on August 7, 2014, on page B3 of the New York edition with the headline: Google and Barnes & Noble Unite to Take on Amazon.